The collection of payments starts after a consensus is reached among local parties concerned, such as residents, governments and tour operators. According to a Shizuoka Prefectural Government official, transparency is a key part of successfully inducing volunteer payments. “It’s important to make clear how the collected payments are used, so climbers are willing to pay,” the official said. For this reason, collectors at the start of each mountain trail explain the purpose of the payments and sometimes distribute brochures seeking the understanding of climbers. Some local governments even offer gifts in return for payments. The Yamanashi and Shizuoka prefectural governments, for example, provide tags made from wood gathered during forest thinning on Mount Fuji and tin badges with drawings of the mountain printed on them, respectively. The town of Yakushima offers straps made from local cedar trees. Other gifts include discounts for hot springs and souvenir shops. As entry payments are collected on a voluntary basis, local governments have been struggling to raise the number of visitors willing to dole out cash. 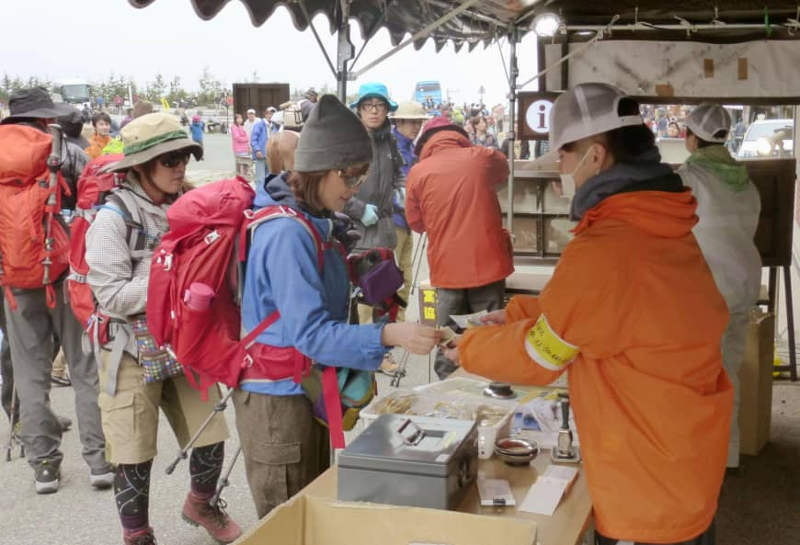 While payments collected for climbing Mount Fuji totaled ¥144.35 million during this year’s climbing season, only about half of the total number of climbers had paid. “Although payments are voluntary, the sense of unfairness between those who pay and those who don’t needs to be reduced as much as possible,” a Yamanashi official said. The prefectural government there has publicized the need to collect entry payments, via travel magazines and brochures, among other means. With the number of foreign visitors to Mount Fuji increasing, the Yamanashi government is also planning to step up multilingual advertising. According to the Yakushima town office, 79 percent of visitors to the island made payments in fiscal 2017. The rate of collection is especially high at bus ticket sales booths because workers ask visitors to make payments together with bus fares. The ministry plans to conduct hearings with localities that have begun collecting entry payments, to gather information as part of a push to encourage more areas to introduce such programs, the National Park Division official said.